In computing terminology, the term “wired” is used to differentiate between wireless connections and those that involve cables. While wireless devices communicate over the air, a wired setup uses physical cables to transfer data between different devices and computer systems. A wired network is a common type of wired configuration. Most wired networks use Ethernet cables to transfer data between connected PCs. In a small wired network, a single router may be used to connect all the computers. Larger networks often involve multiple routers or switches that connect to each other. One of these devices typically connects to a cable modem, T1 line, or other type of Internet connection that provides Internet access to all devices connected to the network. Ethernet and wireless networks each have advantages and disadvantages; depending on your needs, one may serve you better than the other. Wired networks provide users with plenty of security and the ability to move lots of data very quickly. Wired networks are typically faster than wireless networks, and they can be very affordable. There are three basic systems people use to set up wired networks. An Ethernet system uses either a twisted copper-pair or coaxial-based transport system. The most commonly used cable for Ethernet is a category 5 unshielded twisted pair (UTP) cable — it’s useful for businesses who want to connect several devices together, such as computers and printers, but it’s bulky and expensive, making it less practical for home use. A phone line, on the other hand, simply uses existing phone wiring found in most homes, and can provide fast services such as DSL. Finally, broadband systems provide cable Internet and use the same type of coaxial cable that gives us cable television. Advantages of a Wired Network! As wired networks are connected by physically plugging in a cable from one device to another, it is much more difficult to access them without authorization. There is no opportunity for someone wandering past your office windows to hack into your wireless network, for example. There’s no need to give out wireless access keys — a device physically connected to the network is part of it. If you want to keep your network as closed and secure as possible, then a wired network is the way to go. Wired networks bring with them a reliable, constant download and upload speed unaffected by the environment. As these networks are closed off and don’t travel through the air, they aren’t susceptible to fluctuations in speed or interference from other wireless devices. While the most recent 802.11ac Wi-Fi standard can theoretically achieve speeds of 1,000MB per second, older hardware isn’t up to this standard — 802.11n maxes out at 600MB/s. Gigabit Ethernet provides a stable, constant 1,000MB/s connection. The details depend on the computers and devices on your network, but broadly speaking, plugging an Ethernet cable into a laptop or printer is enough for it to recognize the network and get connected. There’s no playing around with scanning for available networks, inputting security keys or trying to locate an area with a strong Wi-Fi signal. Ultimately how convenient this wired networking method is for your company depends on how well equipped your office is and the extent of the existing network cabling. The fastest 802.11n Wi-Fi speed currently in widespread use can achieve a maximum range of 250 feet in the most ideal conditions, although substandard hardware, interference from other devices and physical obstacles such as walls and floors can substantially reduce this distance. Ethernet cabling, in contrast, can stretch up to 330 feet without any loss of quality. If you have a lot of floor space to cover, then a wired solution enables you to stretch your network further than a wireless one. It’s important to buy the right components when setting up a wired network. The primary parts of a wired network are the cable, network adapters, and router. These are described in the following sections. Buy a cable for each PC that won’t be using wireless. You want Ethernet cable, which resembles phone cable but with slightly thicker jacks. Ethernet cable is sometimes called Ethernet RJ-45, Cat 5, or TPE (Twisted Pair Ethernet). The names usually include a number relating to the cable’s speed rating: 10, 100, or 1,000. Each computer on the network needs its own network adapter, and those gadgets come in many varieties. Most computers come with a built-in network adapter, sparing you the cost. Most new laptops come with both wired and wireless adapters preinstalled, letting you connect either way. Broadband Internet users should purchase a router that has enough ports for each networked computer. 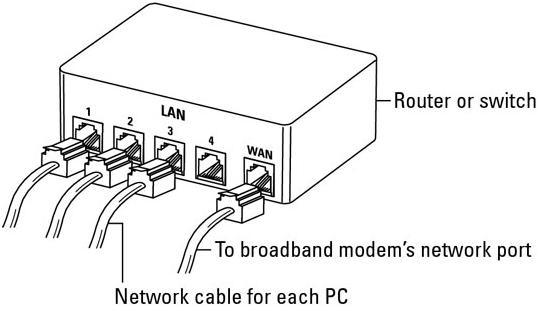 Both a router and switch resemble the one shown in the following figure. The router (or switch) needs a port for every computer’s cable, and the router needs a port for your broadband modem.